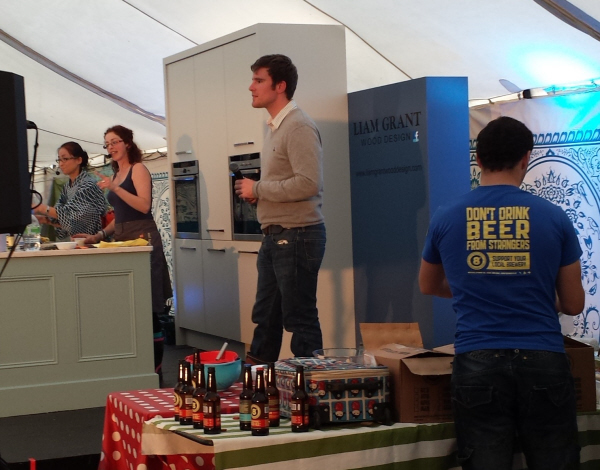 Last year, I spent August doing beer tasting and cooking demos with the Theatre of Food at the Liss Ard, Tall Ships and Electric Picnic Festivals. Do it again for Electric Picnic 2013? Once more, with feeling. 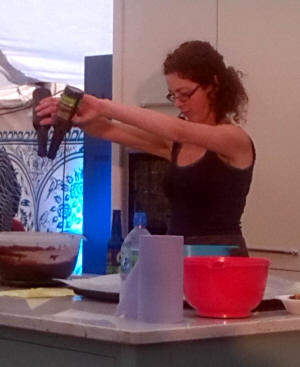 And fermentation, beer, amazake and – couldn’t deprive festival goers of some (fermented) chocolate – Knockmealdown Porter Brownies. Hats off to the Theatre of Food crew, who managed to put together a brilliant line up of chefs and cooks and brewers and bakers and paella-makers to feed the audience with ideas and food. Loved Kevin Aherne’s talk on the 12-mile menu that he cooks at Sage in Midleton as he cooked all kinds of goat, Kevin Thornton’s take on campsite cooking (mint tea for couscous re-hydration and post-EP antioxidants) and the standing ovation given to John and Sally McKenna for all their work with, and on behalf of, Irish food lovers, whether they be restaurateurs, producers or eaters. Thanks again to the Theatre of Food, Catherine and Rachel at VSC Events, to MC William, washer-upper Denis, all the brownie distributors and the Little Brother who was a beer-carrying/taster-offering star. A special mention to the Small Sister who, with her boyfriend, sat in the front row and giggled throughout my demo. Family, huh? Next beer event: The Irish Craft Beer and Cider Festival kicks off this Thursday, 5 September, and I’ll be doing a talk on food and beer matching on Friday, 6 September, at 6pm. Thanks for all your help there, Lily – hope you got your saucepans back!